In accordance with Sect. 6.6.3.1.1 and Sect. 10.14.1.2 out of the ACI 318-14 and CSA A23.3-14 respectively, RFEM effectively takes into consideration concrete member and surface stiffness reduction for various element types. Available selection types include cracked and uncracked walls, flat plates and slabs, beams, and columns. The multiplier factors available within the program are taken directly from Table 6.6.3.1.1(a) and Table 10.14.1.2. Referencing Sect. 6.6.3.1.1 and Sect. 10.14.1.2, the gross section area Ag and moment of inertia Ig are permitted for elastic analysis with factored load levels applied. Determining factored load levels is done utilizing Table 6.6.3.1.1(a) from the ACI 318-14  and the table located under Sect. 10.14.1.2 in the CSA A23.3-14  where, the element type and its condition are taken into consideration. The multiplying factors reduce the moment of inertia while the gross section area stays constant. These factors were conservatively enforced by the various concrete standards to account for section loss due to concrete cracking. According to the ACI 318-14 Sect. 6.6.3.1.1, the moment of inertia and gross area of members/surfaces shall be calculated in accordance with Tables 6.6.3.1.1(a) or 6.6.3.1.1(b) unless a more rigorous analysis is required. Similarly, the CSA A23.3-14 lists a table which includes the corresponding multiplication factors applied to each moment of inertia. Different conditions such as "cracked" and "uncracked" only effects concrete elements categorized under "wall." When calculating the moment and shear for a cracked wall, a factor of 0.70 is applied to the gross moment of inertia Ig. If the wall is indicated to crack, based on the modulus of rupture, the moment of inertia is calculated as 0.35Ig for further analysis. Unlike walls, when analyzing other elements such as columns, beams, flat plates, and flat slabs, the moments of inertia do not change based on cracked or uncracked assumptions. The reduced value is based on a single reduction factor listed below. RFEM seamlessly allows the user to modify the flexural or axial stiffness of any concrete member or surface to be considered for the analysis and design. The component types can be set for each element under the "Modify Stiffness" options within the program. Clicking twice on a single or multiple member/surface opens the "Edit Member/Surface" dialog box. 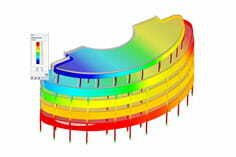 Within this window, the modified stiffness options are found under the "Modify Stiffness" tab. Here the user has the option to select from multiple "Definition Types" such as the ACI 318-14 Table 6.6.3.1.1(a) and the CSA A23.3-14 Table 10.14.1.2. Figures 01 and 02 showcase the previously mentioned standards and their factors relating to the stiffness reductions directly from the ACI 318-14 and CSA A23.3-14.